The primary function of the lung is gas exchange—transporting oxygen from the environment into the blood and eliminating carbon dioxide from the blood to meet the metabolic demands of the tissues. The lung is a series of branching tubes consisting of conducting airways (trachea to terminal bronchioles) and respiratory airways (respiratory bronchioles to alveoli). 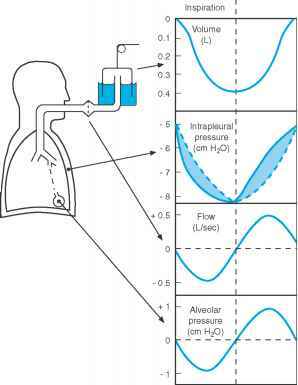 Transport of O2 from small air sacs in the lung, called alveoli, into pulmonary capillary blood occurs by diffusion. The total surface area for diffusion in the lung is as large as a tennis court because there are 300 million alveoli. Quantitative descriptions of gas exchange depend on relatively simple applications of the principle of mass balance and the ideal gas law.